Bitter melon/bitter gourd is nothing but karela and has a very bitter taste. 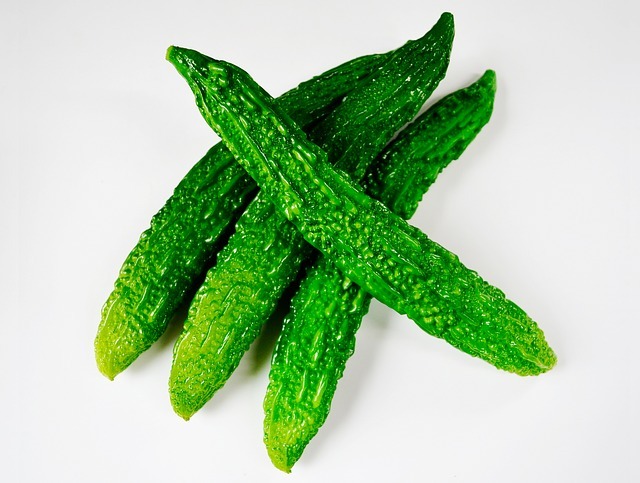 It is dark green in color and has a lot of health benefits in spite of its bitter taste. Having it regularly is excellent for your health and protects you from various diseases. It is a store house of essential vitamins and antioxidants as well as many other nutrients. You can make juice out of it and have it, add it to many recipes or pickle it. Vitamin C is a powerful antioxidant found in bitter melon. It fights against the harmful actions of the free radicals in the body and slows down the process of ageing, by preventing the formation of wrinkles and fine lines on the skin. You also get protection from the damages caused by the ultra violet rays of the sun due to the presence of this vitamin in bitter melon. Bitter melon controls the flow of blood when there is a cut or wound, thus helping it to heal quickly. Consuming bitter melon regularly helps in purifying your blood and keeps the skin free from acne and blemishes, providing a natural glow to the skin. Various problems of the skin like infections, psoriasis, eczema etc can be treated very effectively by consuming bitter melon daily. Fungal infections like ring worm and athlete’s foot are also healed by having bitter melon. Dandruff is cause due to pollution and also by consuming unhealthy food. Mix bitter gourd juice with cumin seeds and apply this pack on your hair. This will help you get rid of dandruff within a month if you apply it regularly. If you have a dry scalp, rub a piece of bitter melon on your scalp and massage with your fingers. If there is itchiness, make a pack by mixing bitter gourd with banana or avocado and apply the mask on your scalp. Use this once a week and the itchiness will be gone. Apply freshly prepared juice of bitter gourd on your grey hair every ten days and this will reduce premature graying of the hair. If you are suffering from hair loss problems, mix bitter gourd juice with a small quantity of sugar and apply on the scalp. Consuming too much of oily food may give you oily hair. So reduce the intake of oily food and apply a mixture of bitter gourd juice and apple cedar vinegar on your hair regularly. This will remove excess oil from the hair. To have beautiful and shiny hair, mix one cup of fresh bitter melon juice with yogurt and apply on the hair. Wait for about 15 minutes and then wash off with water. If you are suffering from skin infections, acne and blemishes, consume bitter melon regularly. This will keep you away from these problems. Various blood disorders like blood boils, scabies, psoriasis, itching, ring worms and many other fungal diseases are also cured by consuming bitter melon. It also has anti-ageing properties. Bitter melon is useful for preventing cancer also. It prevents multiplication of cancer cells and protects you from cancer. Bitter melon is rich in fibers and therefore easily digests the food you consume. The waste is removed from the body. So it prevents constipation and cures all problems of the digestive system. Bitter melon is an excellent remedy for type 2 diabetes. It was used in Indian and Chinese medicines from time immemorial. Type 2 diabetes is caused when the insulin production in the body is insufficient or the body develops a resistance to insulin. As a result the cells are unable to absorb sugar from the blood. By activating the AMP-activated protein kinase in the body cells, sugar can be absorbed. Bitter melon helps in activating these proteins, and thus increases the absorption of sugar. Thus it helps in controlling diabetes. Make a juice from cucumbers, bitter melon, green apples, celery and half of bell pepper. Having this regularly keeps diabetes under control. Bitter melon has some chemicals which are very similar to insulin and therefore reduces the level of sugar in the blood. Heart attack is caused when the walls of the artery get clogged by the deposition of bad cholesterol. Bitter melon lowers the levels of bad cholesterol and thus helps in reducing the risk of heart attack and other heart diseases. It also keep the heart in good health by controlling the level of blood sugar in the body. Bitter melon is also good for keeping your immune system strong. Boil its leaves or fruits in water and have it daily. This will keep you away from infections and also make you immune to various diseases. To have a healthy liver and bladder, have bitter melon regularly. It is also good for avoiding kidney stones. Make juice out of bitter melon and have it every day. This will provide to relief from various liver problems. You will start getting the results within one week. The fresh pods of bitter gourds are excellent for treating various respiratory problems like asthma, cold, cough and many other ailments. Bitter gourd is rich in antioxidants, which are useful in flushing out all the toxins from your body. As a result the metabolism and the digestive system functions are greatly improved, helping you in losing weight effectively. It is very effective in controlling body weight because it is low in calories and contains about 80 -85% water. Because it is low in calorie, you can have it in large quantities without the fear of increasing the calorie intake. Moreover, the high water content in it helps in filling your stomach quickly and prevents over eating.